12mm white belay kernmantle rope for use with 7300 descent device. Rope has polyester sheath and nylon core. 590ft. length. Minimum breaking strength 7,868 lb. Jaco Aerospace and Industrial is your one stop resource for 3M(TM) and DEUS(TM) 12mm Belay Kernmantle Rope 83208-590, White, 590ft. Length, 1 ea and all of your 3M Products, Tapes, aerospace and industrial needs. 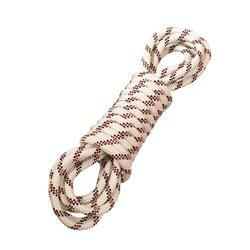 SKU Marketplace Product Description: 12mm white belay kernmantle rope for use with 7300 descent device. Rope has polyester sheath and nylon core. 590ft. length. Minimum breaking strength 7,868 lb.